One of the most significant actions we can take toward achieving greatest potential in life is to learn to monitor attitude and its impact on work performance, relationships and everyone around us. People generally don’t have a high level of bias awareness. Your actions and behavior govern the way you perceive the world and the way the world perceives you. Similarly, the words and deeds of you will be seen by others as an example of the culture of the organization in practice. To make values live and stick, they need to be practiced and visible in everything you say and do – formal and informal. Most people have little insight into what ignites their day-to-day behavior, described as motives or actions, the instrumental forces that drive and direct our behavior are based on a series of tacit beliefs that we have about ourselves. In aggregate, these self-beliefs determine the direction and intensity of our motivated action. The beliefs determine what we do, how we do it, and how we see our accomplishments in relation to the rest of the world. 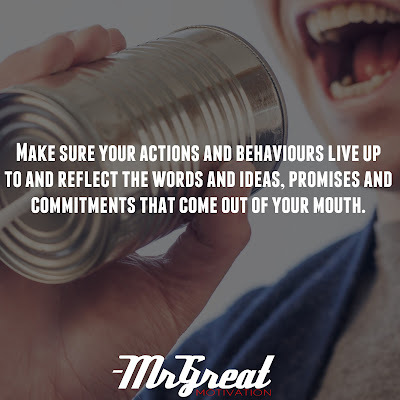 Your ideas and commitments make your actions and behavior more concrete to the world. Spoken words are better able to internalize and understand the others and to allow to affect our behavior.